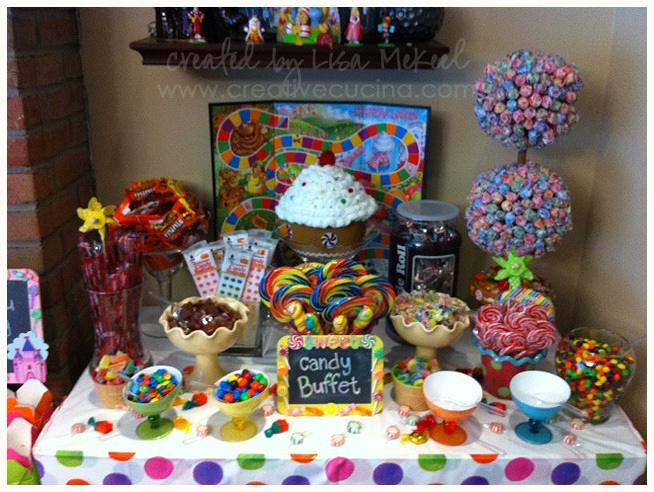 Candy Land was the theme for my daughter’s 5th birthday party. She chose it based on both the board game and her extreme love of candy! 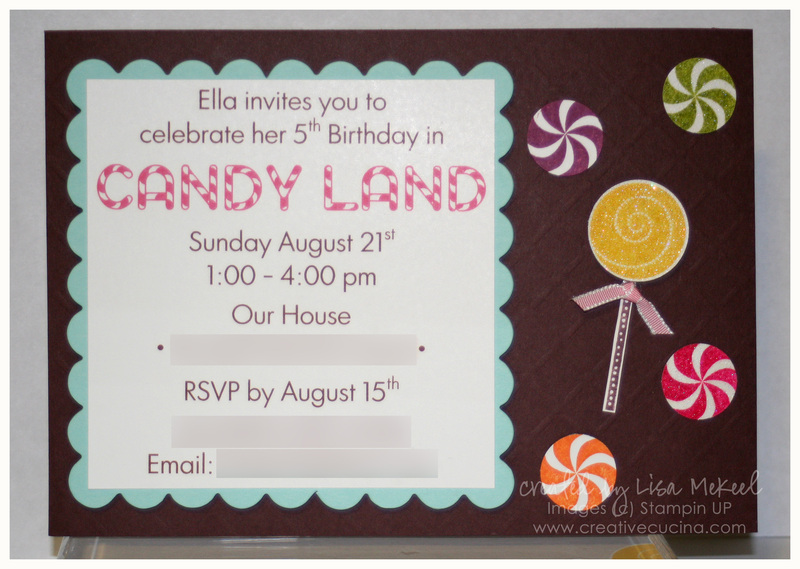 First up, the invitation: I used the stamp set Sweets for the Sweet to make the lollipop and candies. The base is 5″x7″ chocolate chip card stock that I gave some texture to using the Big Shot and the Perfect Details Texturz Plate. The candies were stamped in Pumpkin Pie, Melon Mambo, Rich Razzleberry, and Lucky Limeade. I used Iridescent Ice Embossing Powder and Versamark to make some of them sparkle. I wanted them a bit smaller than the lollipop so I used the 3/4″ Circle Punch to cut them down a bit. As for the lollipop, I stamped it with Daffodil Delight ink and used the Iridescent Ice Embossing Powder on it. A little 1/8″ Taffeta Pretty in Pink Ribbon is knotted and attached with a mini glue dot. The information was printed on Whisper White card stock. The Candy Land type font is called “Candy Cane” and I downloaded it for free online. Behind the printed information is Pool Party card stock that was die cut using the Big Shot and Scallop Square Bigz Die. It’s attached to the base with stampin dimensionals. I didn’t have much time to take pictures during the party, but I did manage to take a picture of the candy buffet. I took it with my phone so the picture is not the best quality, but you can see what I did. The little chalk board sign was painted and decorated using various stickers and little lollipop Christmas ornaments. The lollipop topiary was made using a topiary form (from the floral section of the craft store) and Dum Dum lollipops. Almost 400 lollipops were used to cover the topiary! Various vases, jars, and containers I had around the house or borrowed from my sister held all the candy. The gingerbread cupcake box was found at Hobby Lobby. I used it for a raffle–the prize being a brand new Candy Land board game. Inside the box, I put slips of paper with the childrens’ names and my daughter pulled the winner. We still have a lot of candy left over! I’m going to leave the buffet up for a few more days because it makes me smile when I look at it. I suppose a candy buffet in my living room would come in pretty handy with company stopping by, and my daughter certainly won’t complain! Here are the last two cards I made experimenting with the Flirtatious Specialty Fabric. 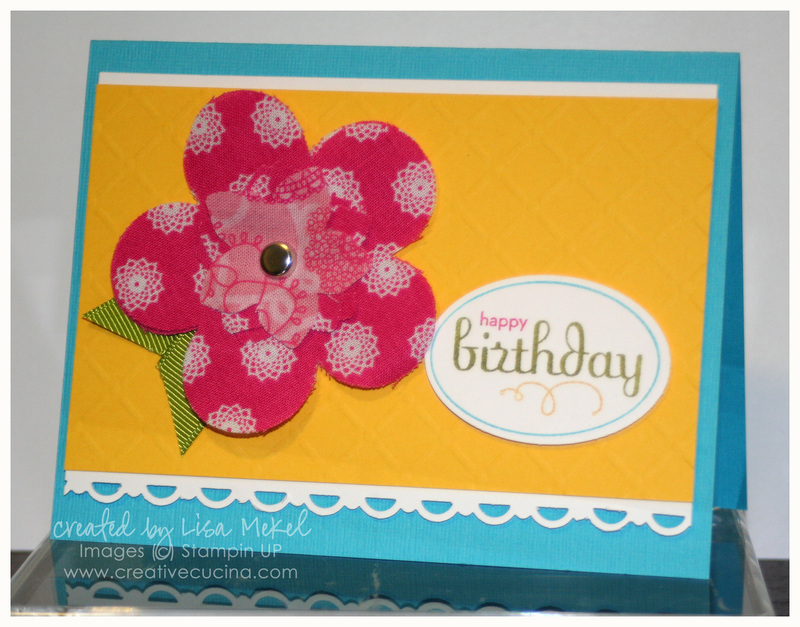 First up is this bright birthday card in Tempting Turquoise, Daffodil Delight, and Melon Mambo. 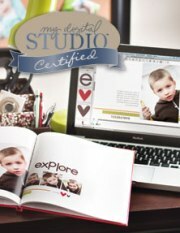 I used the Perfect Details Texturz Plate in the Big Shot to texturize the yellow card stock. I layered it on Whisper White, which I punched with the Scallop Trim Border Punch. 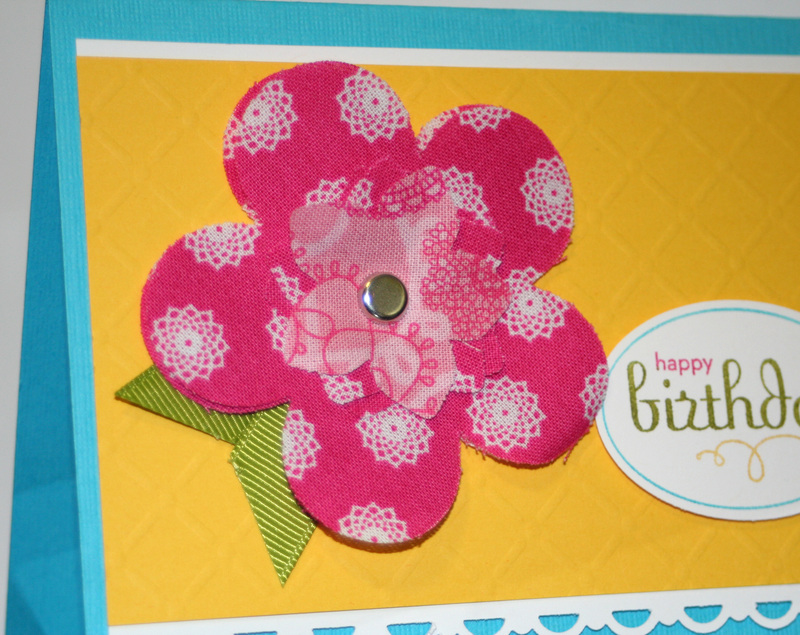 The flower was made using Island Floral Bigz Die. I layered two of the large flowers and two of the small ones, using a 5/16″ Basic Brad in the center to hold them together. I made “leaves” with Old Olive 5/8″ Grosgrain ribbon. As for the sentiment, I used Perfect Punches colored in with SU Markers and then punched using the Extra Large Oval Punch, then attached to the card using stampin dimensionals. Finally, I made one last card with Flirtatious Designer Fabric. It’s a 5″x5″ square using Wisteria Wonder as a base. The next layer is Whisper White, followed by Pretty in Pink die cut with Bigz Scallop Square Die. The fabric was cut using the Scalloped Heart of Hearts Embosslit Die. I layered them onto melon mambo/whisper white squares, with a Small Heart Punch in the center. A rhinestone was added to the middle of each heart. The squares are adhered with stampin dimensionals. The sentiment is from Well Scripted, stamped in Wisteria Wonder ink.